A privately owned producer of aluminum and stainless steel cookware, Regal Ware Worldwide is headquartered in Washington County. The company employs about 300 workers at its corporate and manufacturing facilities in Kewaskum and West Bend. In 2014, over half of Regal Ware’s sales of its American-made products were in foreign markets. Founded by James O. Reigle and two associates in 1945, Regal Ware is directed by the second and third generations of the Reigle family. Focusing on high-end cookware sold directly to the consumer, Regal Ware Worldwide is one of the last remaining examples of Wisconsin’s aluminum and cookware industries. Although Regal Ware traces its founding to 1945, the roots of the company go much deeper. In 1919, Adolph J. Rosenheimer founded Kewaskum Aluminum Company, the company that would become Regal Ware. A prominent Kewaskum businessman, Rosenheimer began Kewaskum Aluminum as a safeguard against Prohibition’s effect on his malt and grain company. Kewaskum Aluminum was one of several aluminum companies founded in Wisconsin in the early 1900s. By 1920, Wisconsin plants were responsible for half of the aluminum cookware sold in the United States. When James O. Reigle, L.N. Peterson, and Edna Oster from Ohio’s Enterprise Aluminum Company bought Kewaskum Aluminum Company in 1945, the company was engaged in military contract work. Reigle and his associates transitioned their renamed Kewaskum Utensil Company back to peacetime production, beginning with the mass production of two saucepans. In 1951, the company was renamed Regal Ware. Through the second half of the twentieth century, Regal Ware expanded via new markets and acquisitions. The company’s early sales model relied on direct sales demonstrations and inclusion in premium catalogs offered by trading stamp companies. Regal Ware’s 1960s acquisitions of aluminum companies in Ohio, Mississippi, and Illinois increased the company’s direct-to-the-consumer catalog. Acquisitions in the 1970s and 1980s, including Club Products, helped Regal Ware expand in the retail market. By 1995, the company’s product lines included over 500 cookware items and kitchen appliances. Direct sales continued to account for over a third of Regal Ware’s sales, and in 1999, the company sold its retail brands to Manitowoc’s Mirro Aluminum Company in order to focus on the direct-to-the-consumer segment. In 2002, Regal Ware acquired the West Bend Company, its long-time local competitor. The West Bend Company, founded in 1911, followed a similar trajectory to Regal Ware. From its West Bend factory, the company produced military supplies during the war years as well as peacetime cookware. Unlike Regal Ware, the West Bend Company was merged into a variety of companies before becoming part of Regal Ware. At the time of acquisition, the West Bend factory was larger and newer than Regal Ware’s Kewaskum plant. Regal Ware closed its main factory in favor of the West Bend location. A smaller manufacturing operation remains in Kewaskum. Beginning in the 1990s, a small portion of Regal Ware’s goods were produced in China, but nearly all of that manufacturing had been returned to the company’s unionized Wisconsin factories by 2008. ^ “Project Profile: Regal Ware Worldwide,” Business Ready WI, accessed April 30, 2016; Tom Held, “Regal Ware Launches E-Commerce Website,” Milwaukee Business Journal, March 30, 2015. ^ Rick Barrett, “Direct Marketing Firm to Sell Regal Ware in China,” Milwaukee Journal Sentinel, December 6, 2014. ^ “History,” Regal Ware Worldwide, accessed April 27, 2016; “Meet the Regal Ware Team Management,” Regal Ware Worldwide, accessed April 27, 2016. ^ Janean Mollet-Van Beckum and the Washington County Historical Society, Washington County’s Aluminum Industry (Charleston, SC: Arcadia, 2009), 7. ^ “History,” Regal Ware Worldwide. ^ Mollet-Van Beckum, Washington County’s Aluminum Industry, 8. ^ James M. Rock, “A Growth Industry: The Wisconsin Aluminum Cookware Industry, 1893-1920,” Wisconsin Magazine of History 55, no. 2 (1971-1972): 87-99. ^ Rock, “A Growth Industry,” 87. ^ Jerry E. Burns, 50 Years of Excellence: The History of Regal Ware, Inc. 1945-1995 ([Kewaskum, WI]: [Regal Ware], 1995), 4, 26. ^ Burns, 50 Years of Excellence, 27-28. ^ Burns, 50 Years of Excellence, 47. ^ Burns, 50 Years of Excellence, 48. ^ Burns, 50 Years of Excellence, 49. ^ Burns, 50 Years of Excellence, 44; Alby Gallun, “Mirro to Buy Regal Ware Cookware,” Milwaukee Business Journal, October 10, 1999, . ^ Mollet-Van Beckum, Washington County’s Aluminum Industry, 7. ^ Mollet-Van Beckum, Washington County’s Aluminum Industry, 7-8. ^ Thomas Content, “Regal to Close Kewaskum Factory,” Milwaukee Journal Sentinel, February 7, 2003, https://news.google.com/newspapers?id=ECwqAAAAIBAJ&sjid=90EEAAAAIBAJ&pg=6239%2C4925025, https://news.google.com/newspapers?id=ESwqAAAAIBAJ&sjid=90EEAAAAIBAJ&pg=6698%2C4946261. ^ James Lutz, “Regal Ware Inks Sale-Leaseback at Kewaskum Industrial Bldg.,” CoStar Group, December 5, 2006. ^ Doris Hajewski, “Regal Ware Brings Production Back to Wisconsin from China,” Milwaukee Journal Sentinel, September 24, 2008. Burns, Jerry E. 50 Years of Excellence: The History of Regal Ware, Inc. 1945-1995. [Kewaskum, WI]: [Regal Ware], 1995. Mollet-Van Beckum, Janean, and the Washington County Historical Society. Washington County’s Aluminum Industry. Charleston, SC: Arcadia, 2009. When entities merge, what happens to their histories? As I have been writing for the Encyclopedia of Milwaukee, this is a question that keeps percolating in the back of my mind. Where does the history of North Milwaukee belong, for instance? The first village incorporated from the Town of Granville, this suburb later merged with the City of Milwaukee. Where does its early history fit? In the Granville entry? In the Milwaukee entry? In its own entry? Does anyone even remember (or care) that North Milwaukee existed? Granville and Milwaukee have their own histories, after all. These entries may mention North Milwaukee, but they are, in reality, distinct from North Milwaukee’s history. Lately, I have been asking many similar questions about the history of the West Bend Company. In 2002, Regal Ware Worldwide acquired the West Bend Company. Prior to being absorbed by Regal Ware, the West Bend Company underwent a dizzying series of ownership adjustments. In 1968, West Bend merged with Rexall Drug and Chemical Company (later Dart Industries). Later, West Bend fell under the control of a merger between Dart and Kraft, Inc. before becoming a subsidiary of Premark International, an offshoot of the subsequent breakup of the Dart and Kraft amalgamation. 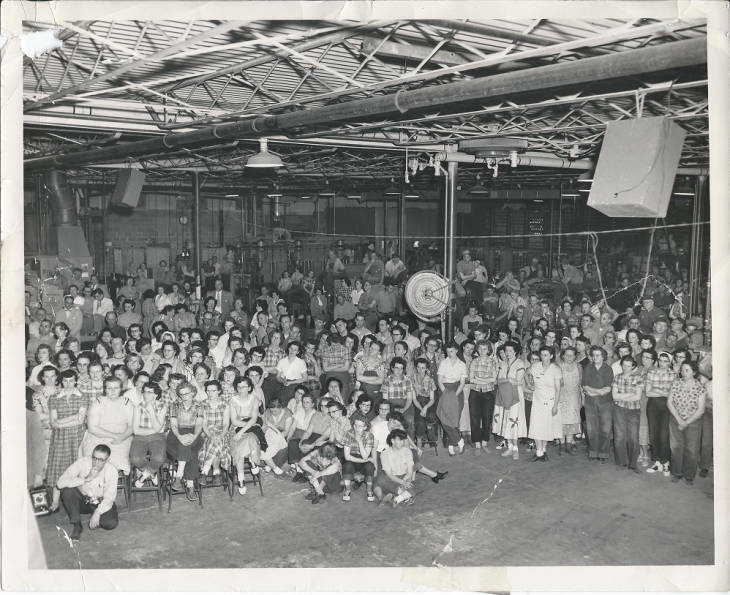 In a simpler time, before all of this corporate gymnastics, the West Bend Company (originally the West Bend Aluminum Company) had been founded in 1911. One of a stream of successful aluminum and cookware companies in early twentieth-century Wisconsin, the West Bend Company produced a variety of kitchen utensils and small appliances from its West Bend factory. Like Regal Ware, the company produced military supplies during World War II. By 1968, about one sixth of West Bend’s residents were employed by the West Bend Company. How does the history of the West Bend Company fit into the history of Regal Ware? Regal Ware, of course, has its own history. As I wrote the Regal Ware entry, I focused on Regal Ware’s founding and growth. I tried to integrate some of the West Bend Company’s history when I spoke of the merger between the two companies, but the primary subject was Regal Ware. The legacy of the West Bend Company remains, however. In 2011, Regal Ware celebrated a centennial of cookware production in Washington County, but Regal Ware was not founded until 1919. This 2011 celebration actually marked the anniversary of the West Bend Company’s founding. As with integrating municipal histories, there is no one correct way to combine company histories. The future of Regal Ware will be built on both the histories of Regal Ware and the West Bend Company, not to mention other companies Regal Ware has acquired over the years. Histories are always narratives, and what we choose to remember and highlight becomes our history. In 2013, the Wisconsin Historical Society erected an historical marker to the West Bend Aluminum Company on West Bend’s Main Street. With this lasting memorial, it looks like the West Bend Company’s history will long be remembered. ^ John Gurda, “North Milwaukee No More: Former Industrial Suburb Blends into North Side,” in Cream City Chronicles: Stories of Milwaukee’s Past (Madison: Wisconsin Historical Society Press, 2007), 168. ^ “Biography/History,” West Bend Company Records, 1911-1989 (Finding Aid), Wisconsin Historical Society, last accessed February 7, 2017. ^ “History,” Regal Ware Worldwide, accessed April 27, 2016. ^ “Celebration of a Century” (flyer), Regal Ware Worldwide, accessed May 24, 2016; “History,” Regal Ware Worldwide.